The sun is shining brighter. Flowers are springing up from the ground. And many families' schedules are about to explode. The season of crazy is upon us. No wonder church attendance becomes sporadic in spring. At this time, it can be so tempting to offer "bait," a big event of some sort that will lure over-scheduled children into our church building. But we need to ask ourselves: Is this really the best thing for our families at this time? I am convinced that one of the best things you can do for families right now is to encourage them to simply eat together. Eating together as a family promotes relationship, understanding, and love. It provides opportunities for kids to digest not only their food, but also the events of the day. Study after study has shown that family dinners are the best environment for meaningful connections. They provide a calm spot in the day, and become an important place for kids to get regular access to parental presence. So... before you start thinking of yet another big thing for the families in your church, perhaps a better option would be to give them a simple strategy and powerful tools to help them gather around the dinner table more often? 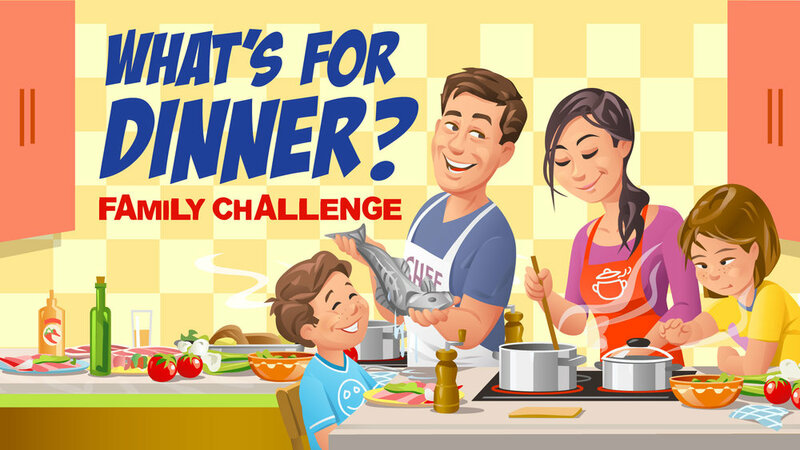 If you're interested in helping the families in your church reclaim the incredible power of the dinner table, check out the What's for Dinner? 40-day challenge. This challenge came out of my personal desire to see the families in my church gather around the table more regularly, and to make the most of the time they spent there. I’m making it available to you with the hopes that it will empower the families in your church to grow closer to each other, and to encounter Jesus in an new way. Hearing laughing and positive conversations at the dinner table. Opening our home to a neighbor boy who has been eating with us regularly almost since the beginning of this challenge. Rich conversations at the table. We loved how it gave us fresh new ways to engage with each other. Both on a fun-loving laughing level, and more serious encouraging ways. We loved having talking points and the reminder to keep things interesting for the kids. On the snow day, we had our neighbors over for sledding in the morning and then they came back over for dinner. We were able to have wonderful God conversations. Our kids loved thinking of ways to make the day special for their friends (hot cocoa, sledding, holding lambs, brick oven pizza, snow ice cream, etc). Two weeks ago, we launched this very same challenge in the local elementary school. I'm so excited for the 300 families that are discovering the beauty of the unhurried life through this unique campaign. Check out the What's for Dinner? challenge and see if this is what the families in your church (and beyond) really need during this crazy busy season. Here's a fun and easy way to make sure that your dinner time as a family is both special and sacred. 1) What was the best part of your day? Talking about the favorite part of the day will let family members celebrate each other. 2) What was the worst part of your day? Talking about the least favorite part of the day will give family members a chance to show empathy and support. 3) Where did you see God at work today? This important question will teach children to be looking for God's involvement in their lives and in those around them. As a result, their spiritual senses will sharpen and their awareness of God's presence in their daily lives will increase. 4) What mistake did you make? This is the BIG one. Kids need to hear their mom and dad openly talk about their mess-ups (age-appropriate of course - lost my temper, ran the red light, got jealous, etc.) This will give them courage to talk openly about their weaknesses and failures. This is the best way to protect our children from soul-destroying shame, teach them the meaning of grace and the power of confession. As they experience the unconditional acceptance of their family they won't have much trouble accepting God's love. Also, imagine the trust that will be gradually built during this particular question. If you do this little ritual consistently, you will notice that every time it will feel a little bit more natural. After a while your children will be looking forward to this time of sharing and will remind you if you missed it. * With younger kids you will want to ask just the first 2 questions and then add to them as kids grow older. The What's for Dinner? Campaign Kit provides you with all the tools you need to make a deep and lasting difference in the lives of people in your church and beyond. Launching and hosting the challenge WILL NOT drain you of your precious time. It takes about 2 hours to set it up and launch it, and 15 minutes a week to maintain it.